Clara was 87 when she climbed up onto that shed roof. It's true - Ray was proud of her. But at 89 years-old himself, he worried about his wife. He reached out to us for help. Now, normally, we wouldn't take on a project as minor as repairing a leaking shed roof. But, this undertaking represented so much more than 300 square feet of roofing. This was an opportunity to connect a lonely older couple with a church family. We arrived as a team of nine volunteers. Two of us tacked the roof and two more supported efforts on the ground. The remaining five spent time with Ray and his wife. Shingles were laid. Nails were hammered down. The leaky shed's roof was made new and watertight. The Good News of Jesus Christ was shared. Ray and Clara have seen hardship. But over the course of the day, we were able to identify and point out critical points where the Lord has worked remarkably in their lives. God never left Ray and Clara. Our Freedom Builders team was blessed to have the opportunity to illustrate the truths and comforts of the Gospel to this lonely, elderly couple. Ray reached out to us because he was worried about his determined wife up on that roof. Now, he and Clara have something much more valuable than new shingles. They have a new group of friends and a church who will continue to pour into their lives the love of Christ. Thanks be to God! 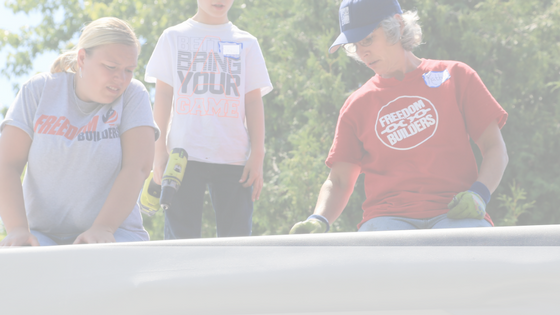 Freedom Builders strives to work with all Christian churches to demonstrate the love of Christ to the least of these. Our typical clients are one very small step away from being homeless or in some situations are currently displaced from their home because the housing conditions have become so deplorable that it is unsafe to live there any longer. It's NOT just about fixing homes. We reach out and serve those in need with the Family of God and share the saving knowledge of Jesus Christ.